Web Services – WordPress, Custom Projects & Support Services | CMGeeks, Inc. Custom Websites, WordPress Themes & Consulting Services. In the website design world, form follows function. Your web presence is an important indication of your business type and service area, but that is just the tip of the iceberg. It augments the public image of your company and serves as a marketing opportunity. It brings customers to you, and helps them to understand your business. While all of these statements are true for good websites, poor quality websites actually serve to detract from the image of a company. It is more important than ever before to establish and maintain a professional web presence as more and more of the world becomes computerized. CMGeeks will take the complexity out of website design. Every new project begins with a free consultation to negotiate project scope and pricing. Projects are generally completed at a fixed project rate, but an hourly rate is applied if the scope of a project cannot be well defined in advance. CMGeeks offers an online web portfolio of some of our past projects. WordPress may have started out as simple blog software, but has evolved into a sophisticated software distribution system. One in every four websites on the Internet today runs on WordPress. Their vast ecosystem of over 50K plugins allows for nearly-infinite customization. CMGeeks can create a new WordPress website, or develop additional functionality for an existing site. From routine maintenance and upgrades, to custom plugin development, CMGeeks can help you leverage the power of WordPress to best serve your business. » View our more detailed page of available WordPress services. After Google's algorithm update in April of 2015 referred to as Mobilegeddon, search engine ranking officially became partially dependent on support for mobile devices. Mobile device usage is accounting for a greater percentage of all web traffic each year, so make sure your site is mobile-friendly! 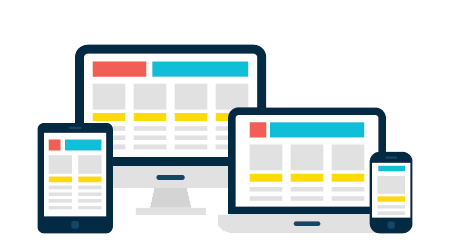 Even if your site design does not support small-screen devices, we can extend your current design structure to support all screen sizes, from desktops to tablets and cell phones. Through the use of media queries and other clever CSS modifications, we can take your fixed-width layout and convert it into a fully mobile-capable design. We define page rules for various screen size ranges that allow content on the page to resize and reposition itself dynamically. Now that cell networks are lightning fast and phones have better screen resolution and browser support, the percentage of mobile traffic to your website is likely much higher than it was in the past. Your website should deliver a consistent look and feel to your audience no matter what device a person is using to maximize conversion rates and sales. → Try Google's Mobile-Friendly Test to find out. Do you have a company email address using your website domain name? If you do, we can integrate your email with Google so you do not have to reconfigure your address if you change web hosting providers. If you do not have a company email address, we will bring your business to the next level by issuing company email addresses and integrating them with your current email client. Do you have custom web project, or other need not listed above? We can handle domain transfers, server migrations, SSL installations & renewals, DNS record management, and all other standard tasks. In addition, we can assist with advanced projects such as mobile-friendly enhancements and E-commerce integrations.